Glutathione Reductase Assay Kit (ab83461) is a highly sensitive, simple, direct and HTS-ready colorimetric assay for measuring GR activity in biological samples. In the assay, GR reduces GSSG to GSH, which reacts with 5, 5'-Dithiobis (2-nitrobenzoic acid) (DTNB) to generate TNB2- (yellow color, λmax = 405 nm). The assay can detect 0.1-40 mU/ml GR in various samples. Glutathione Reductase (GR, EC 1.8.1.7) catalyzes the NADPH-dependent reduction of oxidized glutathione (GSSG) to reduced glutathione (GSH), which plays an important role in the GSH redox cycle that maintains adequate levels of reduced GSH. A high GSH/GSSG ratio is essential for protection against oxidative stress. Review the oxidative stress marker and assay guide to learn about more assays for oxidative stress. ICAC decreased the ROS level induced by EV71 infection via modulating the antioxidant enzymes involved in GSH metabolism. Infected (100 TCID50 EV71) Vero cells were treated with medium or 100 µM ICAC for 12 h. Uninfected cells were used as the control group. The antioxidant enzymes activities of the Vero cells were detected (n = 3). All results were expressed as the means ± SEs. Asterisks indicate that the data significantly differ from the EV71 group at the P < 0.05 level according to one-way analysis of variance. Glutathione reductase measured in mouse tissue lysates showing activity (mU) per mg of extracted protein (T1=2 min; T2=30 min). 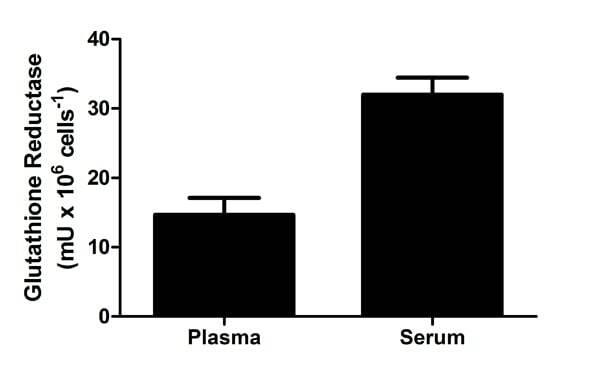 Glutathione reductase measured in human plasma and serum (T1=2 min; T2=30 min) showing activity (mU) per ml of tested sample. No activity was detected in saliva or urine. Glutathione Reductase assay time line using ab83461. 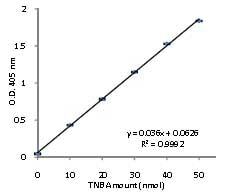 TNB Standard Curve using ab83461. Publishing research using ab83461? Please let us know so that we can cite the reference in this datasheet. The procedure is given in protocol booklet. Please thaw frozen tissue on ice. Once thawed add assay buffer and proceed for homogenization. - If lysis is confirmed spin down and collect the supernatant as required. I hope this information is helpful to you. Please do not hesitate to contact us if you need any more advice or information. Are you planning to use antibodies for detection of these enzyme. Which application you would be interested in e.g. Immunohistochemistry or western blotting. If you are planning to use antibodies then please use are website there are range of antibodies available as per your requirements. Use our products? Submit an Abreview. Earn rewards! I am inquiring about your total antioxidant capacity assay kit or similar. I have frozen placental tissue from rabbit experiments and I am wishing to examine markers of oxidative stress. The most important markers for me are glutathione peroxidase and reductase, superoxide dismutase (SOD) and catalase. Can you kindly advise me if any of your products are potentially of use and a quote for cost please. I am in Belgium. Could you please clarify; do you want to detect these markers in your tissue samples or you just want to assay the activity of these enzymes? I will be looking forward to hearing from you soon.